It’s funny what tiny little ice crystals can do. Floating high in the air, suspended by air currents, they hang there… and then a ray of sunshine enters them. The light gets bent due to complicated physics, the interplay of that beam of light passing from air to a solid crystal and out again. But once that beam leaves, the sky can light up with a wizard’s pattern of colors and shapes. And if you’re very, very lucky, you’ll see something that you’ll remember the rest of your life. Mind you, this picture is real. David Hathaway – appropriately enough, a solar physicist at NASA’s Marshall Space Flight Center in Huntsville, Alabama – took it using a wide-angle lens to get the whole thing. It’s a High Dynamic Range shot, meaning he combined pictures with 3 different exposure times to see both faint and bright things simultaneously. He took the shot on October 30, 2012. Everything you’re seeing here is pretty well understood: they all have a name and a specific set of circumstances under which you can see them. The Sun is the bright blob near the horizon. It’s circled by the 22° halo, a fairly common optical effect in the winter; I see dozens every season. On either side of the Sun are parhelia, nicknamed sundogs. Those are the teardrop-shaped rainbows. Sometimes, as seen here, these stretch out into long streamers called parhelic circles. They are parallel to the horizon but in this wide-angle shot the shape is distorted, bending them up. Directly above the Sun, dipping down to touch the halo (the math term for this is osculating, which means kissing) is a gull-wing curve called the tangent arc. Above it, connecting the "wings", is the Parry arc. As an aside, I’ve seen tangent arcs only twice in my entire life. One was at a University of Virginia football game in the winter when the Sun was setting. It was so bright and looked so much like a V that I joked that it was a sign we’d win the game. Georgia Tech trounced us. So much for divination using signs in the sky. Above the tangent and Parry arcs is a faint rainbow (well, it’s not caused by raindrops, but it’s broken up into colors and has the familiar rainbow-shape) called the Parry supralateral. Faint and off to the right, nicking the supralateral, is a tightly-curved rainbow called the Parry infralateral. Amazingly, there are still two more to go! The upside-down rainbow at the top is called a circumzenithal arc, because it’s centered on the zenith, the point directly above your head. Finally, the last thing I can see is a very faint white vertical oval on either side of the the 22° halo and going off the top of the frame, past the circumzenithal arc. That’s the heliac arc, something I’d never even heard of before looking it up here. That’s a new one for me. Amazing, aren’t they? 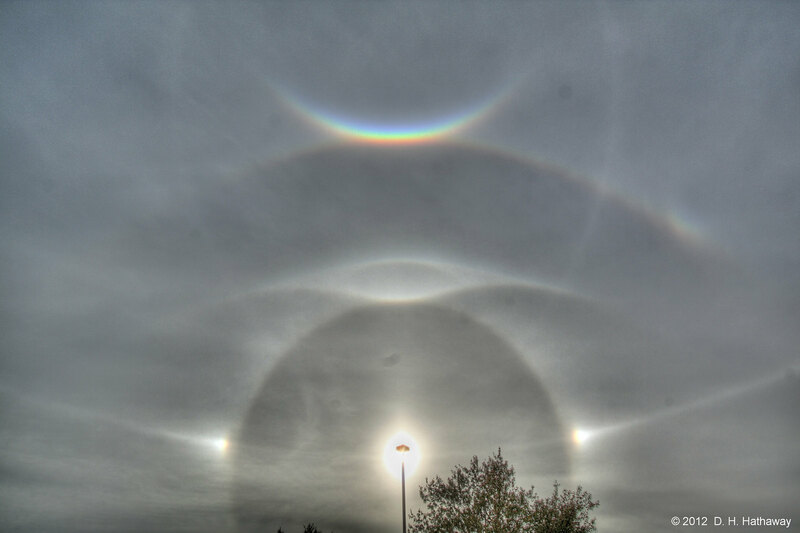 And get this: there are lots more kinds of phenomena like this, and they’re all caused by ice crystals in the air! The crystals have different shapes – some are flat, some barrel-shaped, so they bend light differently, and their orientation to us causes all these fantastic displays. Wow. You can see a lot of the same features as in David Hathaway’s picture, too (in fact, Joe made a diagram so you can see what’s what). BABloggee Alan French let me know that there’s a fine gallery of them on Flickr, too. It’s possible some of this was due to ex-Hurricane Sandy getting moisture high in the atmosphere where it could freeze into crystals. But I’ll note again that I have seen many of these same haloes myself. Most are not rare at all, and all you need to do is keep your eye on the sky. Seriously, one of the first things I do on any day where there are high clouds is look near (not at!) the Sun and see if there’s anything to be seen. Usually there isn’t. But sometimes, just sometimes, you get that amazing display that makes all the fruitless searching totally worth it. Look up! There’s a whole Universe out there. And some of the coolest stuff is really close to home, literally just over your head. Image credits: David Hathaway; Joe dePasquale, used by permission. Tip o’ the Snell’s Law to SpaceWeather.com and to Elwood Herring for pointing it out to me.